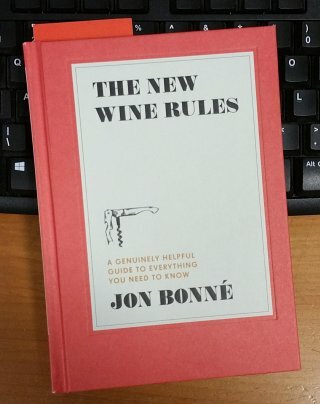 The New Wine Rules – a genuinely helpful guide to everything you need to know, by Jon Bonné. This was just over £9.00 online from Wordery, including postage. Right from the off I will say that a few parts of this book are obviously written for the US market, in terms of both language and content. But it is not a huge issue for me, and I note that Amazon UK are selling a version with a different cover that will published at the end of May. Perhaps this will be an edition more geared up for the UK? The book is of modest size, consisting of 89 “rules”, each one occupying anything from a few lines to two or three pages. I use quotation marks around the word “rule” because many of them are not so much rules as snippets of information about wine. I think it is fair to say that they are aimed at relative newbies to the world of wine. They might well appreciate a lot of the advice, but I was not so impressed, and took issue with a fair proportion of it, to a greater or lesser extent. I feel it is not only important to keep your target audience happy, but also to provide information that is appropriate, good quality, and clear, and although I accept these book was not written for us wine smart-arses, we are still entitled to an opinion on the quality of the content. I actually thought the book got off to a great start. Rule 1: Drink the rainbow. Absolutely. Be adventurous, explore, and don’t be limited by tradition and traditional advice. At this point, I felt that the book my hands was the one I wanted to write myself, and this Jon Bonné chap had beaten me to it curse him. Rule 2: Forget “the best wines”. Drink the good. Spot on. Jon and me stand shoulder-to-shoulder. Other objections of mine are a bit more factual. For example, Jon implies at one point that white and red wines should be stored at different temperatures. I know some agree with him, but as far as I know (and I have just googled to confirm it) most people think it is fine to use the same cellaring temperature for all wines. Particularly in a book aimed at novices, even if there is some doubt on this issue, I think an author’s instinct should be to keep things simple. Another rather bizarre statement is that, in the 1855 classification, “all 5 levels” are considered Grand Crus. Perhaps by some, but I have not seen it before. I have seen them called Grands Crus Classées in one or two place, but usually they are simply Crus Classées. Also, according to Jon, Großes Gewächs wines no longer have to be dry. Really? It is the first I have heard of it, and I can find nothing about it when I google, but he might be right. But regardless of whether he is right or wrong, do his readers really need to know about this? More generally, I am far from convinced that the best way to present information about wine is as a set of short rules. On the other hand that structure must be ideal from the point of view of the convenience of the writer, and it is duly noted for my book, which it seems I am going to have to write after all. Overall, if I were asked to recommend a book for beginners I would suggest something with a more traditional format. I have a very high regard for Michael Schuster’s Essential Winetasting, which I used extensively when getting into wine. And if I return to it now I am still impressed by how accurate it is, even if it is written at an introductory level. So, especially as a new edition of Essential Winetasting was published last year, that is the book I would recommend.